Who is going to win the world cup in South Africa in 2010, what are the world cup odds on Holland winning the world cup. 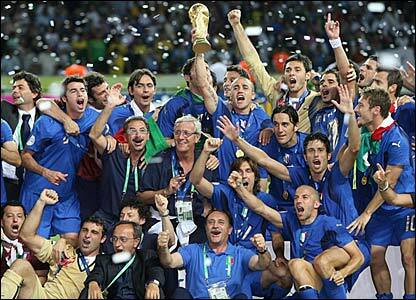 Italia World Cup final 2006. WORLD CUP The quality of the most important sporting event outside the Olympic Games has been slightly diluted in recent years as Fifa bow to political pressure by allocating more qualifying spots to countries from Asia and Africa, but the cream usually rises to the top eventually. Since sports betting took off at the start of Italia 90, the longest-priced winner has been 7-1, while Germany at 20-1 were the biggest-priced team to make the final. In a tournament of shocks in 2002, Rudi Voller's nondescript outfit took advantage of numerous countries being taken out in the group and last-16 stages. But Greece's 100-1 Euro 2004 victory means it would be dangerous to assume we need not look too far down the lists to find the winner, although one should never overlook the well-known fact that, up to and including the 2002 finals, only Brazil (in the 2002 World Cup and in Sweden in 1958) were successful outside their own continent. Obviously, the climate and pitch conditions can have a huge significance, particularly in the baking heat, and you should always be looking at a team who are well suited to the weather. And even though the favourites usually thrive in the World Cup, the pre-tournament betting is never unfailingly accurate and a smattering of outsiders usually get into the knockout stages. So in this new world, in which trading positions on the exchanges are so popular with clued-up punters, don't be afraid to back sides who are outsiders with a view to laying them back at shorter prices. In the modern era, Sweden (50-1) and Bulgaria (80-1) both made the semi-finals in USA 94, Croatia (66-1) reached the last four at France 98 and co-hosts South Korea also fell only at the last hurdle having been available to back at 300-1 in 2002. South Korea had ideal climatic conditions as well as some favourable refereeing decisions in their favour but the common factor in those other big-priced semi-finalists was an ability to score goals. Croatia's Davor Suker triumphed in the Golden Boot, while Hristo Stoichkov, the Bulgaria talisman in 1994, was joint top-scorer with six goals. So if you are attracted to an underdog with a lethal hitman, the chances are they could do some serious damage. Talking of the Golden Boot, it generally all comes down to which strikers' teams are drawn in an easy group. Ronaldo in 2002 faced 1,000-1 pokes China, Suker managed to play against both Japan and Jamaica, while Stoichkov made hay against Greece, who had just three teams below them in the outright betting in 1994 and were a shambolic outfit compared to the side that went on to conquer Europe ten years later. Another move to consider is to lay all the group favourites. In 1990 and 1998 you would have won a negligible amount by backing all the group favourites to a level stake, but the market leaders blew up in 1994 and 2002, when punters staking £10 on each would have lost £15.67 and £31.94 respectively.